Background: Tephrosia purpurea is an Indian herb used in traditional medicine to treat various diseases such as jaundice, asthma, liver and urinary disorders. However, the anti-cancer potential of T. purpurea on hepatocellular carcinoma (HCC) is poorly understood. Therefore, this study aims to investigate the anti-cancer activity of T. purpurea in HepG2 hepatocellular carcinoma cells. Methods: The leaves and root of T. purpurea were extracted with methanol using soxhlet apparatus. 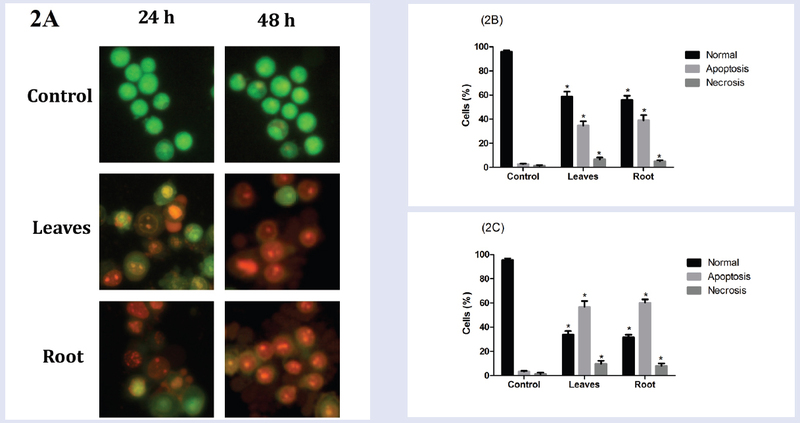 The cytotoxicity of the T. purpurea extracts in HepG2 cells was evaluated using MTT assay whereas the mode of cell death was examined by AOEB, Hoechst and JC1 staining under a fluorescence microscope. T. purpurea extracts-induced caspase-3 expression was investigated using colorimetric assay. Results: The leaves and root extracts inhibited HepG2 cell growth at the IC50 of 102.33 ± 10.26 µg/mL and 276.67 ± 20.43 µg/mL respectively at 24 h. Chromatin condensation, nuclear fragmentation, apoptotic bodies formation and mitochondrial membrane depolarization were observed in HepG2 cells treated with both extracts. The caspase-3 expression was significantly (p < 0.05) increased in extracts treated cells when compared to control. Conclusion: The leaves and root extracts of T. purpurea induce apoptosis mediated cell death in HepG2 cells. The leaves and root extracts of T. purpurea exhibited anticancer activity in HepG2 hepatocellular carcinoma cells. These extracts induced cell shrinkage, DNA condensation and fragmentation, mitochondrial membrane depolarization and upregulated caspase-3 expression indicating T. purpurea extracts induce apoptosis in HepG2 cells. The current knowledge about the potential mechanisms responsible for the anti-proliferative activity of T. purpurea extracts on HCC cells is limited. Therefore, the present study aims to investigate the cytotoxic and the apoptotic properties of methanolic extracts of leaves and root of T. purpurea on human hepatocellular carcinoma cell lines. Fresh T. purpurea plant was collected from JIPMER Campus, Puducherry, India and authenticated and deposited in TNAU (Tamil Nadu Agricultural University) Herbarium, Coimbatore, India with voucher No. : BSI/SRC/5/23/2012-13/Tech.368. The leaves and root of T. purpurea plant material were washed, shade dried and powdered separately. One hundred gram of each part of the plant materials were extracted with methanol using soxhlet apparatus. Both extracts were concentrated to a paste and stored at 4° C until use. Plastic wares (Tarson), MTT (Sigma), sterile dimethyl sulfoxide (DMSO) (Merck), RPMI 1640 medium (Sigma), fetal bovine serum (FBS) (Sigma), trypsin (Sigma), penicillin and streptomycin (Himedia), acridine orange and ethidium bromide (Sigma), Hoechst (Sigma), JC-1 (Sigma) and caspase-3 assay kit (Raybiotech) were purchased for this study. HepG2 human hepatocellular carcinoma cells were obtained from the National Center for Cell Science (NCCS), Pune, India and maintained in RPMI 1640 medium supplemented with 10% fetal bovine serum, 100 µg/mL streptomycin and 100 U/mL penicillin. The HepG2 cells were stored at 37°C and supplemented with 5% CO2 in a humidified incubator. Once these cells were grown upto 70% confluence, the cells were passaged. Cytotoxic property of T. purpurea extracts was evaluated in hepatocellular carcinoma cells (HepG2) using MTT [3-4, 5-dimethylthiazole-2-yl, 2,5-diphenyl tetrazolium bromide] assay. MTT is a standard colorimetric assay to evaluate the percentage of cell death. Approximately 5,000 cells were seeded in 96 well plates and incubated for one day at 37ºC in CO2 incubator. On the following day, media was refreshed and different concentrations of leaves (25-250 µg/mL) and root (50-500 µg/mL) extracts were treated in HepG2 cells and maintained for 24 h. Then, 20µl of MTT (5 mg/mL) was added to each well and incubated for 4 h. After incubation, media was removed, and formazon crystals were dissolved by adding 100 µl of DMSO. Plates were mixed properly for 5 min and absorbance was measured at 570 nm. Data were collected from triplicates of each extract and the mean with the standard deviation were used for analysis. The concentration of extracts required to inhibit 50% of the cancer cell growth is termed as IC50 value. Acridine orange (AO) and ethidium bromide (EB) dual staining was performed to evaluate the morphological changes of cells due to apoptosis or necrosis. HepG2 cells were seeded in six-well plates, and IC50 concentration of methanolic leaves and root extracts were incubated for 24 h and 48 h. After the incubation period, the cells were harvested by trypsinization, washed and resuspended in cold Phosphate Buffered Saline (PBS). The cell suspension was stained with AO/EB (0.1 mg/mL) and a drop of cell suspension was placed on a glass slide and covered with a coverslip. At random 300 cells in triplicate were observed in each sample under a fluorescent microscope (Carl Zeiss, Jena, Germany) using a UV filter (450 - 490 nm). The percentage of live cells and dead cells showing morphological changes such as apoptosis or necrosis were analysed from nuclear and cytoplasmic structural changes. Hoechst staining was used to examine the nuclear morphological changes of cancer cells. 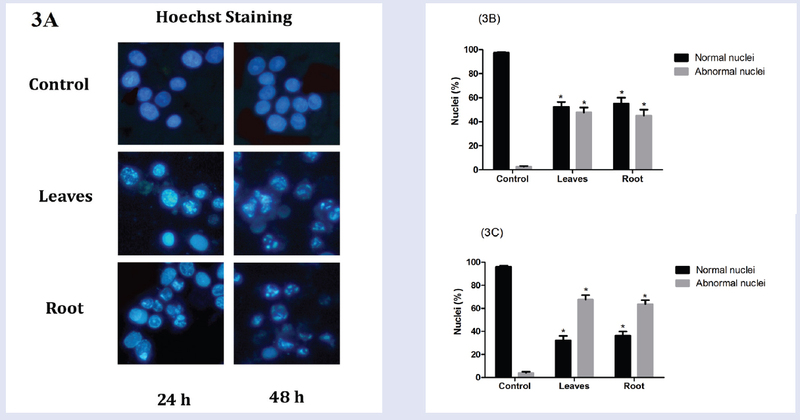 Like AO/EB staining, after treatment with IC50 of methanolic leaves and root extracts for 24 h and 48 h, the cells were harvested and stained with Hoechst 33258 (1 mg/mL in PBS) and incubated for 5 min at room temperature. Nearly 300 cells in triplicate were observed under a fluorescence microscope at 400 × magnification (377-355 nm) and the percentage of cells reflecting nuclear morphological changes were analysed and calculated. Loss of mitochondrial membrane potential (ΔΨm) is an early indicator of apoptosis, and it was detected by lipophilic, cationic dye JC-1 (5, 5', 6, 6'-tetrachloro-1, 1', 3, 3'-tetraethyl-imidacarbocyanine iodide). The cells were grown on glass coverslips (22 × 22 cm) placed in 6-well plates and the IC50 concentration of methanolic leaves and root extracts of T. purpurea were treated and incubated for 24 h and 48 h. After the incubation period, the cells were stained for 10 min with the JC-1 dye that selectively enters mitochondria. Here, live cells appear as orange-red and apoptotic cells appear as green based on the extent of loss of mitochondrial membrane potential. The mitochondrial depolarization of cells was observed under fluorescence microscope. T. purpurea extracts induced caspase-3 activity in HepG2 cells was measured by caspase-3 colorimetric assay kits, according to the manufacturer protocol (Ray Biotech Caspase-3 Colorimetric Assay Kit). HepG2 cells were treated with the IC50 concentrations of methanolic leaves and root extracts and incubated for 24 h and 48 h. Control and treated cells were pelleted and lysed in 50 µl of chilled lysis buffer and incubated on ice for 10 min. Cells were centrifuged for 1 min at 10,000 x g and the supernatant was transferred to a fresh tube. Protein concentration was estimated by the method of Lowry et al. Later, 50 µg of protein in 50 µl of lysis buffer was added to a 96-well plate and mixed with 50 μl of 2X reaction buffer (10 mM DTT). Then 5 µl of 4mM DEVD-pNA substrate for caspase-3 was added and incubated at 37°C for 2 h in the dark and caspase-3 expression was measured at 405 nm. All the results were expressed as mean ± standard deviation (SD) of three independent experiments. The difference between groups was analysed by one-way analysis of variance (ANOVA) followed by Bonferroni using GraphPad Prism-6.0 (Graphpad Software Inc, USA). P< 0.05 was considered statistically significant. The leaves and root extracts showed a potent cell growth inhibitory effect in a dose-dependent manner, the IC50 (inhibition concentration 50%) values being 102.33 ± 10.26 µg/mL and 276.67 ± 20.43 µg/mL for 24 h respectively [Figure 1]a and b.
Methanolic leaves and root extracts of T. purpurea treated HepG2 cells were subjected to AO/EB staining. Usually AO will enter the nucleus and stain live cells as green colour and EB will penetrate the nucleus of dead cells due to loss of membrane integrity and stain as red colour. In this experiment, viable cells appeared as green fluorescence with highly organized nuclei. Early apoptotic cells appeared as green-orange colour nuclei with condensed or fragmented chromatin and late apoptotic cells appeared as orange to red colour with highly condensed or fragmented chromatin and apoptotic bodies. Necrotic cells fluoresced orange to red without chromatin fragmentation. The IC50 values of methanolic leaves and root extracts treated cells showed typical apoptotic morphological features such as condensed nuclei, membrane blebbing and formation of apoptotic bodies in a time-dependent manner, which were clearly observed under the fluorescence microscope and quantitated [Figure 2]a-c.
Apoptotic nuclear morphological changes in HepG2 cells by treatment of methanolic leaves and root extracts were evaluated by Hoechst 33258 staining. The IC50 values of leaves and root extracts treated HepG2 cells appeared as bright blue with apoptotic nuclear morphological changes at 24 h and 48 h.
These changes include chromatin marginalization, DNA condensation and fragmentation and formation of apoptotic bodies. In untreated cells, there were no morphological changes; nuclei fluoresced as faint blue which was homogenous [Figure 3]a-c. The effect of extracts-induced depolarization of mitochondrial transmembrane potential was examined using JC-1 dye. Control cells emitted red fluorescence indicating intact mitochondrial membrane potential. However, both extracts treated HepG2 cells expressed progressive and complete loss of red to green fluorescence at 24 h and 48 h respectively, due to mitochondrial transmembrane depolarization. T. purpurea extracts disturbed mitochondrial membrane potential and induced apoptosis in a time-dependent manner [Figure 4]. T. purpurea extracts-triggered apoptosis-mediated death of HepG2 cells for 24 h and 48 h was analysed by caspase-3 assay. 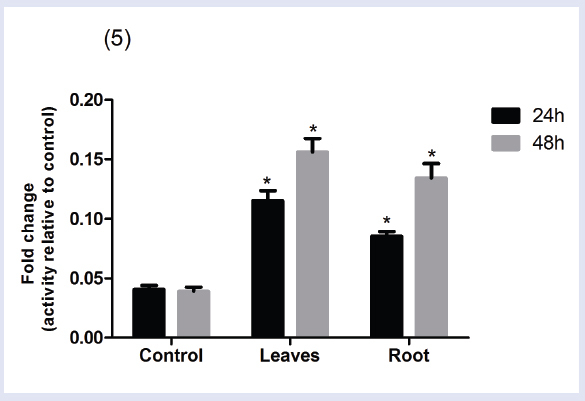 As shown in [Figure 5], the leaves and root extracts significantly (p < 0.05) induced caspase-3 expression when compared to control in a time-dependent manner. 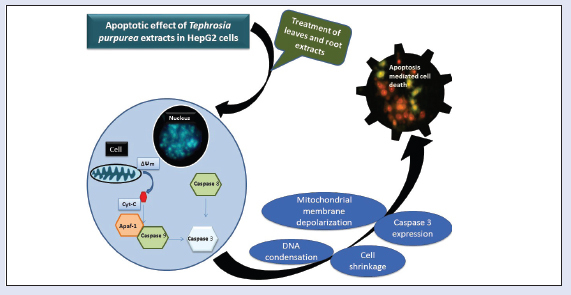 In the present study, we have investigated the T. purpurea extracts induced apoptosis-mediated cell death in HepG2 cells. Both leaves and root extracts of T. purpurea induced cytotoxicity in HepG2 cells. However, leaves extract exhibited more anti-proliferative activity as compared to root extract. Gulecha et al. also reported the in vitro anticancer activity of fractions of T. purpurea leaves on MCF7 cancer cell lines. Despite the cytotoxic activity of T. purpurea, the mechanism of cancer cell growth inhibitory effect was not yet explored. Therefore, we have investigated that the T. purpurea induced apoptosis-mediated cell death in HepG2 cells. 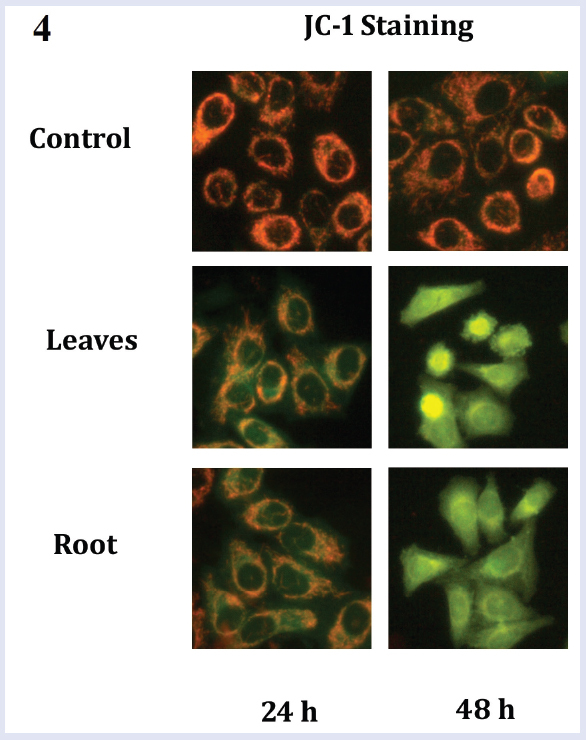 The leaves and root extracts of T. purpurea induce apoptotic morphological changes in HepG2 cells such as nuclear shrinkage, DNA condensation, fragmentation, membrane blebbing and formation of apoptotic bodies as evidenced by the results of AO/EB and Hoechst staining. The JC1 staining result also suggested that the extracts of T. purpurea triggered apoptosis-mediated cell death in HepG2 cells. Mitochondrial swelling is often associated with loss of transmembrane potential and it is considered as an important phenomenon, which occurs as an early event of apoptosis. Loss of mitochondrial membrane potential followed by the release of cytochrome C from mitochondria to the cytosol leads to subsequent activation of caspases resulting in apoptosis. In the present study, the loss of mitochondrial membrane potential was observed in extracts-treated cells and analysed using JC1 dye. These staining results suggest that the extracts of T. purpurea triggered apoptosis-mediated cell death in HepG2. To confirm this apoptosis induction by T. purpurea extracts in HepG2 cells, activation of caspase-3 was assessed using the colorimetric method. Caspases are a family of cysteine proteases, and they are strongly considered as important mediators of apoptosis. Caspase-3 activation is positively associated with induction of apoptosis, and it is a downstream enzyme of both intrinsic and extrinsic apoptotic pathways. This colorimetric assay revealed overexpression of caspase-3 in the leaves and root extracts treated samples when compared to control. Previous studies reported that several plant extracts and active compounds such as Tulbaghia violacea, Costus speciosus, epigallocatechin-3-gallate (EGCG) and silybin induced caspase-3 mediated apoptotic cell death on HCC.,,, The results obtained from the current study also confirmed that the T. purpurea extracts have the ability to cause apoptosis-mediated cell death in HepG2 cells through caspase-3. This study concludes that the methanolic leaves and root extracts of T. purpurea exert anti-cancer activity in hepatocellular carcinoma cells, and the activity is mediated through apoptosis by induction of caspase-3. In the light of our findings, it may be prudent to isolate the active compounds of the plant and demonstrate their molecular mechanism of anti-cancer activity. The authors thank JIPMER intramural research grant for financial support and MGDC, Bharathidasan University for providing cell culture lab facility. Ryder SD. Guidelines for the diagnosis and treatment of hepatocellular carcinoma (HCC) in adults. Gut 2003;52:1-8. Sanyal AJ, Yoon SK, Lencioni R. The Etiology of Hepatocellular Carcinoma and Consequences for Treatment. Oncologist 2010;15:14-22. Osaki Y, Nishikawa H. Treatment for hepatocellular carcinoma in Japan over the last three decades: Our experience and published work review: HCC therapy for three decades. Hepatol Res 2015;45:59-74. Hollebecque A, Malka D, Ferté C, Ducreux M, Boige V. Systemic treatment of advanced hepatocellular carcinoma: From disillusions to new horizons. Eur J Cancer 2015;51:327-39. Blanchet B, Billemont B, Barete S, Garrigue H, Cabanes L, Coriat R, et al. Toxicity of sorafenib: clinical and molecular aspects. Expert Opin Drug Saf 2010;9:275-87. Gokhale SB. Textbook of Pharmacognosy. Nirali Prakashan Pune, 1979. Kirtikar KR, Basu BD. Indian Medicinal Plants. 2nd ed. Allahabad: Lalit Mohan Basu; 1956. Chinniah A, Mohapatra S, Goswami S, Mahapatra A, Kar SK, Mallavadhani UV, et al. On the potential of Tephrosia purpurea as anti-Helicobacter pylori agent. J Ethnopharmacol 2009;124:642-5. Shenoy S, Shwetha K, Prabhu K, Maradi R, Bairy K, Shanbhag T. Evaluation of antiinflammatory activity of Tephrosia purpurea in rats. Asian Pac J Trop Med 2010;3:193-5. Juma WP, Akala HM, Eyase FL, Muiva LM, Heydenreich M, Okalebo FA, et al. Terpurinflavone: An antiplasmodial flavone from the stem of Tephrosia Purpurea. Phytochem Lett 2011;4:176-8. Pavana P, Sethupathy S, Santha K, Manoharan S. Effects of Tephrosia purpurea aqueous seed extract on blood glucose and antioxidant enzyme activities in streptozotocin induced diabetic rats. Afr J Trad CAM 2009;6:78-86. Gulecha V, Sivakuma T. Anticancer activity of Tephrosia purpurea and Ficus religiosa using MCF 7 cell lines. Asian Pac J Trop Med 2011;4:526-9. Latt SA, Stetten G, Juergens LA, Willard HF, Scher CD. Recent developments in the detection of deoxyribonucleic acid synthesis by 33258 Hoechst fluorescence. J Histochem Cytochem 1975;23:493-505. Reers M, Smith TW, Chen LB. J-aggregate formation of a carbocyanine as a quantitative fluorescent indicator of membrane potential. Biochemistry 1991;30:4480-6. Li Z-F, Wang Z-D, Ji Y-Y, Zhang S, Huang C, Li J. et al. Induction of apoptosis and cell cycle arrest in human HCC MHCC97H cells with Chrysanthemum indicum extract. World J Gastroenterol WJG 2009;15:4538-46. Bras M, Queenan B, Susin SA. Programmed cell death via mitochondria: different modes of dying. Biochemistry (Mosc) 2005;70:231-9. Porter AG, Jänicke RU, Emerging roles of caspase-3 in apoptosis. Cell Death Differ 1999;6:99-104. Saibu GM, Katerere DR, Rees DJG, Meyer M. In vitro cytotoxic and pro-apoptotic effects of water extracts of Tulbaghia violacea leaves and bulbs. J Ethnopharmacol 2015;164:203-9. Nair SVG, Hettihewa M, Rupasinghe HPV. Apoptotic and Inhibitory Effects on Cell Proliferation of Hepatocellular Carcinoma HepG2 Cells by Methanol Leaf Extract of Costus speciosus. Bio Med Res Int 2014 2014;637098. Zhang Y, Duan W, Owusu L, Wu D, Xin Y. Epigallocatechin-3-gallate induces the apoptosis of hepatocellular carcinoma LM6 cells but not non-cancerous liver cells. Int J Mol Med 2015;35:117-24. Zhang S, Yang Y, Liang Z, Duan W, Yang J, Yan J, et al. Silybin-Mediated Inhibition of Notch Signaling Exerts Antitumor Activity in Human Hepatocellular Carcinoma Cells. PLoS ONE 2013;8:e83699.